This is my first humidor. It’s not large, but it is my attempt at a “fine box” humidor that can hold 30 or so cigars in proper condition. I wanted the box to appear as if it might have been made around 1830. I gave up smoking many years ago, so my son gets this one to store his occasional cigar. It’s 12” x 8 1/4” x 6 1/4” high. It differs in construction from most humidors insofar as the carcase is a lamination of Baltic birch ply and Spanish cedar, coming to a total thickness of about 5/8”. I wanted to avoid the typical “slip-in” lining of cedar, which tends to make the sides overly thick and clumsy looking. It’s not much more trouble to make the cedar an integral part of the structure. The lid interior was a bit more tricky with the domed interior pieces forming a tight lip seal. Most noticeable is the cavetto-shaped lid and the miniature Townsend-Goddard style ogee bracket-foot base. The veneer pattern is complex but typical of furniture of the golden era. The veneer is walnut burl for the two-way book matches on the sides, and quarter cut walnut for the cross-banding, separated by a small rope inlay banding. The lid is a four-way book match with a small traditional fan inlay. The lock escutcheon is a lamination of curly maple and black veneers, providing a black line on the inside edge of the keyhole. The interior is Spanish cedar, including the single ventilated cedar tray. The interior is designed to allow free air flow all round the cigars. Four small pedestals support the tray and position it to allow for airflow around each side. As this box has no edging, per se, the veneers must of course meet cleanly at the each edge. I deviated from my usual French polish this time. The finish is WaterLox (my favorite tung oil varnish) over Herter’s French Red, my favorite pre-coat for black walnut. It’s a filler with a light coloring agent available from www.brownells.com . Stuff lasts forever on the shelf, but most importantly, it imparts a wonderful, warm color to the walnut. That “old gunstock” color, which was it’s original purpose. The WaterLox is applied with a brush, a film built up, then cut back and polished to obtain a fully filled, mirror finish. The underside is, of course, finished as well, and displays my maker’s mark. The humidifier assembly is a digital unit from www.bcspecialties.com It was recommended by Richard at BCS, who was very helpful. It’s a bit larger than some units, but it’s fully automated, shows a continuous humidity readout, and I expect it will work well. It also has the advantage of both a battery pack and a wall plug option for providing power. The power access plug is visible on the bottom. So that’s it, my best shot at making a humidor. I’m already working on my next project, a rather intricate octagonal jewelry box with both shaped sides and lid. Beautiful box Roger, love the work you do with walnut veneer. You surprised me with a different finish. Great box inside and out. Afraid I am not a lover of feet on a box. Dam i dont smoke cigars but i would love to have a box like this on my coffee table. Saweeeeeeeeet! Roger you never fail to impress with extremely high quality of the beautiful boxes you make. Thanks for sharing and providing the inspiration to become a better woodworker. Great work, nice desgn. I especially love the corners. I like the detail in them. Thanks. First humidor, but not first box. Trust me, my first box wasn’t quite like this one. It’s the most beautiful box I’ve seen in some time—and given the quality of craftsmanship displayed here frequently, that’s saying a lot. I love everything about this box, Roger. Inspirational as always! Superb work Roger. Every detail is exquisite,but sadly I’m not surprised by it. Another fine looking box Roger. I look forward to see the next one as well. Outstanding Roger. You had us waiting on this one. Very stylish and classy. All of your boxes are truly inspired. 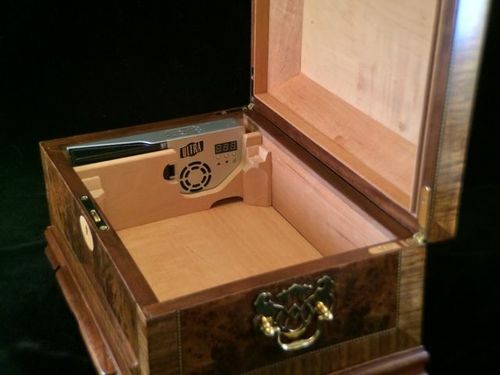 You have definitely raised the bar with this humidor. I LOVE the feet. Yea, I just looked at your other projects, I’ve seen you’re work b4.. Was thrown off by the first humidor fine box. but they were separate sentences…. DOH! That is a beautiful humidor! I’ll bet your son loves it! I also like your photography. Looks like something you’d see in Cigar Aficionado! Remarkable work and very inspiring. I have been looking for motivation to get me back into the shop and projects like this sure help. It would be super great and really nice if you could share the project progress via pictures as I am very interested in how this comes together. Granted, it is a lot of work to post project progress and details, but each time I see a project this nice, I am very interested in how it came together.